We’re big fans of what Aldi does for breakfast: the eggs, the French toast, the sausage, the turkey sausage, the pancake-and-sasusage-on-a-stick … all of it. And we are big fans of Aldi’s hash brown patties, which do a great McDonalds impersonation. 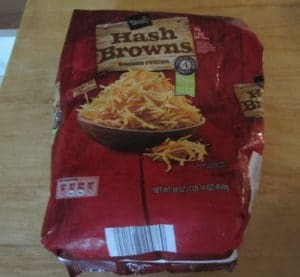 For this post we are turning our attention to Aldi’s shredded hash browns. And, as it turns out, the bag we picked up even came with a recipe for something a little different. So we tried that out, too. Let’s talk about the main product first. Season’s Choice Shredded Hash Browns — or, as they’re called on the packaging, Season’s Choice Hash Brown Shredded Potatoes — are a Regular Buy in Aldi’s frozen section, usually near other like-minded breakfast and potato products. They come in a 30-ounce (1 pound, 14 ounces) bag and are kept in your freezer. The standard cooking instructions call for pan frying them either in oil or in water, with oil being the recommended approach. A cooking spray can be used in place of oil. We prefer using olive oil ourselves, but vegetable oil also works. The water and oil instructions are similar. With oil, you put 3 tablespoons on the skillet, heat to medium (350 degrees), add a single layer of hash browns, then cover and cook for 10-12 minutes, turning once for uniform cooking. With water, you heat the skillet to medium (350 degrees), add 3 tablespoons of water, add a single layer of hash browns, then cover and cook for 10-12 minutes, turning once. In both cases, a light golden brown color is a sign the hash browns are done. Although we like the ease of Aldi’s hash brown patties, these are fun to cook. We like topping them with over-easy eggs, salt, and pepper, but you can do all kinds of things with shredded hash browns. Before we get into the actual package directions, there are a few things you’ll want to do first. One, you’ll want to make sure you cook and chop the bacon. We found that five slices of Appleton Farms Sliced Bacon was about right, and we cooked it over medium-low to medium heat, turning frequently, to make sure it came out crisp but not burned. When it’s done, we set it on a paper towel to drain the bacon grease and let it cool. Two, you’ll want to chop the onion and spinach. Not as awesome as bacon, but important. While the bacon is cooking and cooling, we chopped up the onion, then chopped up enough spinach to make a half cup. So, once you have your bacon, spinach, and onion all chopped up and ready, here’s what’s next. Scramble 2 of your eggs in a medium bowl. Add the hash browns, 2 remaining eggs, cheese, bacon, spinach, and onions to the scrambled eggs and stir. Take a 1/2 cup of the hash brown mixture, form into a round patty, and CAREFULLY (emphasis from the packaging) place into the hot oil. Reduce heat, cook for 2-3 minutes per side or until golden brown. When we first made the mix, we took one look at it and determined there was no way we were going to be able to form a round patty out of that concoction. It was simply too liquid. So we took a 1/2 cup measuring cup and used it to ladle the pancakes. We used a griddle to cook them, although a skillet works fine. We found that 2-2 1/2 minutes was fine for each side. Once done, we pulled them out and prepared to serve. 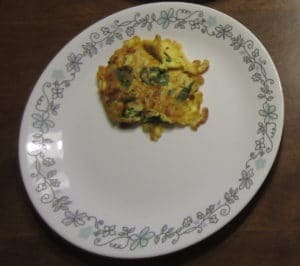 A breakfast potato pancake, all by itself on a plate. This recipe makes four. Taste-testing was done by two adults and two children. The two adults, myself included, really liked them. One of the children didn’t like it, while one of the children said it was merely “okay” (before eating up the part the other child didn’t eat). I thought the flavor and texture were both good, with the bacon in particular adding enough flavor that I didn’t feel the need to add salt or pepper, although you could. 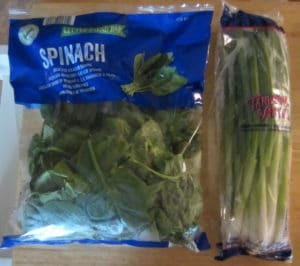 Also, I tried cooking these with and without the spinach, and I couldn’t really taste a huge difference in flavor. So if you’re on the fence with these over the spinach, we think you can safely add the spinach for a health boost without sacrificing taste. One other note: the recipe yields four decent-sized pancakes. We’re not sure they’re enough for more than 2-3 people, though, so if you’re feeding a larger brood you’ll probably want to either double the recipe or add some other side items to complete the meal. We really like the Season’s Choice Shredded Hash Browns on their own merits. They’re not too hard to cook, and they serve up well with all manner of breakfast options. But we also really like the Breakfast Potato Pancakes recipe on the bag. The pancakes are a little different from your traditional breakfast food but are also quite tasty. We recommend both. Appleton Farms, Carlini, Fit & Active, Goldhen, Little Salad Bar, Season's Choice, Tanimura & Antle. Bookmark. We have started cooking bacon in the oven and freezing it. Line a rimmed baking sheet with parchment or tin foil, then cut a pound of bacon in half. Lay out all the bacon, (a pound normally takes 2 cookie sheets), bake at 400 turning once and rearranging the sheets if needed. Drain on paper towels. Use what you need and freeze the rest. Then you have a pound of bacon at the ready and it is SO MUCH LESS MESS! Some people cook it on a cooling rack that fits inside a rimmed cookie sheet.